The 9th chord is frequently used in styles like funk and jazz. The chord is constructed by adding the ninth note in the scale to a dominant 7th chord. The C9 for example, includes the following notes: C, E, G, Bb and D.
The diagrams show the 9th chords in movable versions. Adapting to these versions makes the chord really simple to memorize. 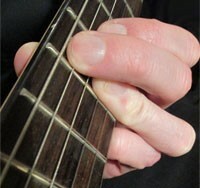 To play the chord you have to lay your ring finger over the three highest strings (see picture to the right). It is also possible to skip the high E-string (i.e. the 1st string), and in that case you can instead use all four fingers. If you leave out the high E-string, you will not play the fifth, but it is alright to omit that note in a 9th chord. An easier way to play these chords is to remove the tone on the 5th string. This turns the chord into a voicing without the root note and, for example, C9 will be played XX2333 and F9 will be played as XX7888. To be more flexible, you could learn a shape with its base tone on another strings. This shape is using the 6th string for the bass and root note. Here is a third alternative, which use the 4th string for the bass and with the root note on the 1st string. Notice that 9sus are identical to one version of the 11th chord. In C9+5 the fifth is raised and in C9b5 the fifth is flattened.